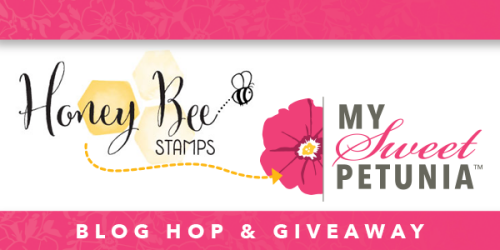 Honey Bee Stamps and My Sweet Petunia Blog Hop! The My Sweet Petunia team is hopping with Honey Bee Stamps today! Leave a comment on each stop on the blog hop for a chance to win a MISTI (winner’s choice of an Original or a Mini) from My Sweet Petunia or the Honey Bee Stamps Gift Certificate! The MISTI winner will be announced on the My Sweet Petunia Blog on April 7th. 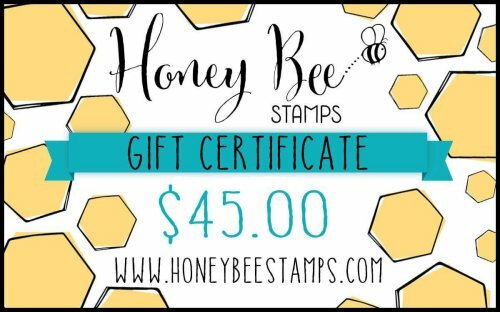 The Honey Bee Stamps winner will be announced at the Honey Bee Stamps Blog. 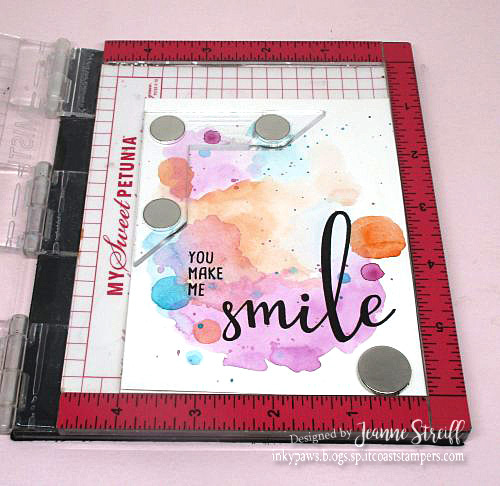 I used and my Mini MISTI along with Curious Kitties and Smile stamps from Honey Bee Stamps. I created my watercolor background and let it dry completely. I stamped the sentiment in black ink. I used my Creative Corners magnets to hold my paper in place. I stamped my kitty with my Mini MISTI from with black waterproof ink (Brutus Monroe Detail). Hint- Keep your stamp in your MISTI. I colored with watercolors and then let dry and restamped in my Mini MISTI for a super clean image. I cut out the kitty and added it to my card. This entry was posted in All Occasion, Honey Bee Stamps, MISTI Tool, QoR Modern Watercolors, Tutorials. Bookmark the permalink. such a pretty card 🙂 love the water colored background. thanks for sharing ! Cute as can be. What a beautiful, fun background with the water coloring. Love the sweet kitties. Cute card. Great tip for stamping again after coloring…thanks! Hi Jeanne! What a darling card!! That kitty is precious and I love the colorful background! I love that adorable little kitty and your background that you created! Such a cute card! Thanks for sharing! 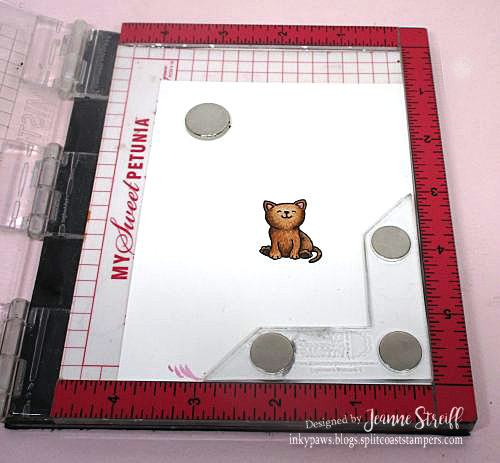 Great card….the cat and the background are perfect for your card – wonderful combo! Very cute card. Love the background. Your card definitely made me SMILE. The kitty is so cute. Kittens make me smile! Beautiful card. I admire your vibrant blending. The cards are stunning. That background is fabulous and who can resist that cute kitty! I really like the Misti corners. Looks helpful with the card. Very cute and colorful. The cat is perfect with the SMILE! I have this stamp set and needed some ideas for using them. I love your background and the tip about leaving the stamp in the MISTI so you could stamp over it again. 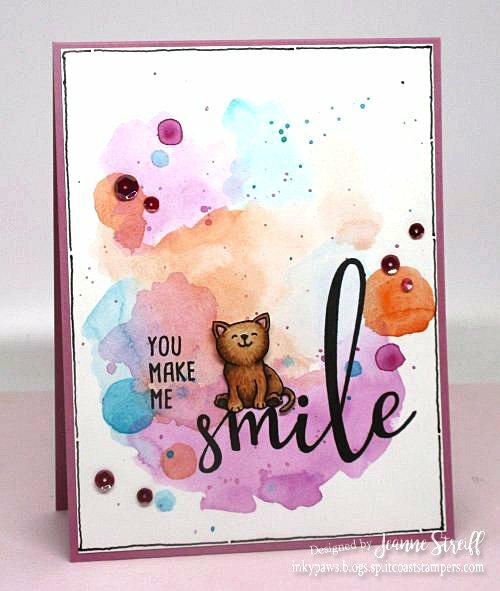 This card is absolutely adorable and your watercolor background is gorgeous! Love the background and cute kitty! Whimsical ! Made me smile !!! The background colors are awesome. Super cute card! I love your watercolor background! Your card did make me smile! So cute! Very cute with this kitty. I like the watercolored background too. THIS makes me smile. So fun!!! Great stamp sets and watercolor background. What a fantastic card. Love the background. Great card…love the tip about keeping the stamp in the Misti, colouring your image and then restamping. Too cute! Love the splashed background! Oh, I just LOVE your background! A very cool watercolor background that really grabs your attention. Oh my Jeanne, this CARD made me smile! Just adorable! I love that kitten stamp. Very cute! Love your colors! lovely card; love the water coloring! Love it, love it, love it. The sentiment, the font, the fantastic watercolored background and adorable kitty. Wihs there was a video to go with it, would have loved to have seen you create the background. Watercolor background s is one of my favorites and yours is so vibrant and pretty! Awesome card! The watercolored background is beautiful!! Adorable! The MISTI is certainly the greatest stamping tool. I could not make cards without it now that I have been using mine for years. So adorable! Love the kitty stamp. Love kitties and love, love, love this card! Thanks for sharing! Love the colors and your cat is adorable! Adorable card! Love the stamps and background! I can not get enough of the blotchy watercolor background. I just love it. Now if only I could do it without it turning into a muddy mess! Thanks, Jeanne, adorable card! Great techniques! I think this kind of background is my favorite to me make and see. So pretty! This is such a sweet and cute card. I’d love to see how you colored that background on a video. Hint, hint! I like seeing how you made your background. Beautiful watercolor, and your kitty is adorable! I love all the sentiments that are included with these stamp sets. What a sweet card Jeanne. 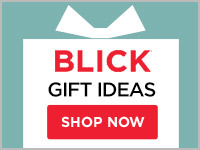 Love the cute image… great tip re-stamping the image again. Love the cool and colorful background. So cute and sweet. Love the watercolor background. Super cute card. Love that kitty and your back ground is great. Pretty card! Love the sentiment and that adorable kitty! Awesome background! I love the little Kitty. Re stamping after coloring really sets it off. Thanks for sharing. Super cute card! I love the watercolor background to ground the sweet little kitty. I really like the cute, cute kitty cat. Your card is great. I didn’t realize how cute the kitty is until I saw it on your card. Such a happy card – really did give me a smile! This card is so pretty!! The beautiful watercolor background is perfect for the cuteness of the kitten! What an adorable and fun card! Cute card. I like seeing how the corners are used. Looking forward to having my own Misti Corners. I love your card! That watercolor background is awesome! 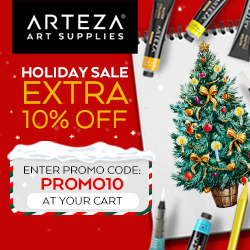 Oh my, what a wonderful tip to get a sharp image after water coloring! I love your card. The background rocks! Thank you so much for the inspiration! Great card and beautiful water coloring. Love the kitty stamp. Thank you for sharing your ideas and techniques. This is DARLING! I love how you colored that adorable kitty! Kitties! Any card with a kitty on it is a masterpiece! I love each and every one of your cheerful, colorful kitty cards! Adorable! What an adorable card. I love the watercolor background. Love the kitty – she’s so happy. Love the unique colors you used! Adorable!! I love the little kitty!! I really like your watercolored background. Very sweet card! Your background is beautiful, but your kitty cat steals the show! The texture that you created is awesome! Love the background and those kitties are darling! Oh my goodness!!! Such adorable card!!! Love so much your background!!! Love that kitty and love that “smile”! It’s a beautiful card. Thank you for sharing! Sweet kitty and a wonderful font for the “smile”. Thanks for the share. Such an adorable card! LOVE the splatters on the background and that cute kitty. Thank You! Cute inky card! Looks fun to do! Beautiful background! One altogether card creation.